کانسار روی- سرب (باریت) هفت‌سواران شرقی به سن کرتاسه تحتانی، در منطقه معدنی اراک، در محیط کششی حوضه پشت قوسی ملایر- اصفهان تشکیل شده است. کانه­زایی در کانسار هفت­سواران شرقی در دو افق مجزا رخ داده است. افق اول یا افق اصلی کانه­زایی در بخش فوقانی واحد آهکی KLلایه و افق دوم در آهک­های نازک‌لایه واحد Ksh,m تشکیل شده است. ساخت و بافت ماده معدنی جانشینی، توده­ای و رگه- رگچه­ای و دگرسانی­های اصلی آن دولومیتی، سیلیسی و کلسیتی است. کانی­های سولفیدی کانسار شامل اسفالریت، گالن، کالکوپیریت، تترائدریت، پیریت، بورنیت، کالکوسیت و کولیت و کانی­های باطله آن کوارتز، کلسیت و دولومیت هستند. مطالعات کاتدولومینسانس روی کانی­های کربناته نشان‌دهنده تشکیل سه نسل دولومیت و یک نسل کلسیت است. نسل اول دولومیت‎ها همراه با کانه­زایی ضعیف و نسل دوم، دولومیت­های غنی از آهن هستند که کانه­زایی مرحله اصلی را همراهی می­کنند. دولومیت­های تأخیری نسل سوم، همراه با کلسیت­ هستند و مراحل مختلف کانه­زایی را قطع می­کنند. حضور پیریت فرامبوییدال همراه با اسفالریت و گالن در زمینه آن و باریت­های ریز خودشکل، حاکی از رخداد کانه­زایی در مراحل رسوب‌گذاری و ابتدای دیاژنز اولیه در نزدیک کف دریاست. در ادامه، مرحله اصلی کانه­زایی با گسترش بافت جانشینی سولفیدهای درشت‌بلور نسل دوم به جای سولفیدهای نسل اول در زیر کف دریا مشخص می­شود. با توجه به تشکیل کانه­زایی هفت‌سواران شرقی در محیط زمین­ساختی کششی، سنگ میزبان آهک توده­ای و رخداد کانه­زایی به‌صورت جانشینی در زیر کف دریا در طی دیاژنز، می­توان این کانسار را همانند کانسارهای نوع ایرلندی در نظر گرفت. The Early Cretaceous Eastern Haft-Savaran Zn-Pb (Ba) deposit situated in the Arak mining district and occurred within the extentional back-arc of Malayer-Esfahan basin. Mineralization occurred in two horizons in the Estern Haft-Savaran deposit. First horizon is major horizon that formed within the most upper portion of the massive limestone and second horizon occurred in the thin limestone which is alternate with shale and marl. Textures of the mineralization in this deposit are replacement, massive and vein- veinlets, and main alterations are silisification, dolomitization and calcitization. Sphalerite, galena, chalcopyrite, tetrahedryte, pyrite, bornite, chalcosite and covelite are the sulfide minerals and quartz, calcite, dolomite and sericite are gangue minerals in the ore deposit. Cathodoluminescence study in this deposit indicates three dolomites and one calcite generations. First generation of dolomite associated with weak mineralization and second generation of dolomite is Fe-rich and associated with main mineralization. Third generation of dolomite is late dolomitization and formed with calcite and cross-cutted the mineralization. Presence of framboidal pyrite with galena and sphalerite in its matrix and fine-grain euhedral barite suggest mineralization began during sedimentation and early diagenesis stage near seafloor. In continuum, main ore is identified as replacement occurrence of first generation sulfides by second generation coarse-grained sulfides under seafloor. With regarding to the formation of the Eastern Haft-Savaran deposit in the extentional tectonic setting, massive limestone as the host rock, and mineralization formation as replacment during diagenesis of the host rock under the seafloor, this deposit would be classified as Irish type deposit. آقانباتی، س. ع.، 1383- زمین‌شناسی ایران، سازمان زمین‌شناسی و اکتشافات معدنی کشور، ص 556. بویری، م.، راستاد، ا.، محجل، م.، ناکینی، ع. و حق­دوست، م.، 1394- ساخت و بافت، کانی‌شناسی و چگونگی تشکیل رخساره­های سولفیدی در کانسار روی-سرب- (نقره) تپه سرخ با سنگ میزبان آواری- کربناتی، جنوب اصفهان، فصلنامه علوم زمین، شماره 97، صص. 221 تا 236. جزی، م. 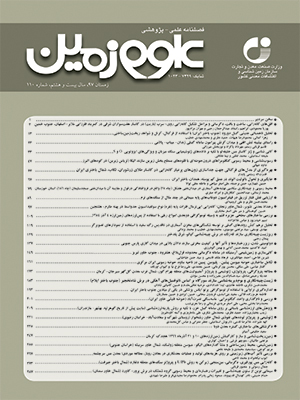 و شهاب پور، ج.، 1389 - بررسی خصوصیات کانی‌شناسی، ساختی، بافتی و ژئوشیمیایی معدن سرب نخلک، اصفهان، مجله زمین­شناسی اقتصادی، شماره 2، ج 3 ، صص. 131 تا 151. مغفوری، س.، حسین­زاده، م. ر.، رجبی، ع. ا. و عظیم­زاده، ا. م.، 1395الف- تحلیل رخساره­ای سنگی و جایگاه چینه­ای افق های کانه­زایی روی- سرب- باریت با میزبان کربناته- تخریبی در توالی رسوبی کرتاسه پیشین، حوضه جنوب یزد، فصلنامه علوم زمین، شماره 102، صص. 233 تا 246. مغفوری، س.، حسین­زاده، م. ر.، رجبی، ع. ا. و عظیم­زاده، ا. م.، 1395ب- کانسار دره‎زنجیر، نمونه­ای از کانسارهای روی-سرب با میزبان کربناته (MVT) در توالی رسوبی کرتاسه پیشین، حوضه جنوب یزد، فصلنامه علوم زمین، شماره 103، صص. 11 تا 26. موحدنیا، م.، راستاد، ا. و رجبی، ع. ا.، 1391- کانسار روی- سرب آب‌باغ؛ نمونه‌ای از کانسارهای روی و سرب با سنگ میزبان آواری- کربناته در جنوب شرقی­ترین بخش کمربند فلززایی ملایر- اصفهان، سی و سومین گردهمای علوم زمین. واعظی­پور، م. ج. و خلقی، م. خ.، 1386- نقشه زمین­شناسی 1:100000 ورچه. سازمان زمین­شناسی و اکتشافات معدنی ایران. Alavi, M., 1994- Tectonics of the zagros orogenic belt of Iran: new data and interpretations. Tectonophysics, V. 229, p. 211-238. Bazargani-Guilani, K., Nekouvaght Tak, M. A. and Faramarzi, M., 2011- Pb–Zn deposits in Cretaceous carbonate host rocks, northeast Shahmirzad, central Alborz, Iran. Aust. J. Earth Sci, V. 58, p. 297-307. Dunham, R. J., 1962- Classification of carbonate rocks according to depositional texture. In Ham, W.E. (eds. ), Classification of carbonate rocks. American Association of Petroleum Geologists Memoir, V. 1. pp. 108–121. Ehya, F., Lotfi, M. and Rasa, I., 2010- Emarat carbonate–hosted Zn–Pb deposit, Markazi Province, Iran: A geological, mineralogical and isotopic (S, Pb) study. Journal of Asian Earth Sciences, V. 37, p. 186-194. Gadd, M., Layton-Matthews, D., Peter, J. M. and Paradis, S. J., 2016- The world-class Howard’s Pass SEDEX Zn-Pb district, Selwyn Basin, Yukon. Part I: trace element compositions of pyrite record input of hydrothermal, diagenetic, and metamorphic fluids to mineralization. Miner Deposita, V. 51, p. 319-342. Goodfellow, W. D. and Lydon, J. W., 2007- Sedimentary exhalative (SEDEX) deposits. In Goodfellow W. D., (eds. ), Mineral Deposits of Canada: A Synthesis of Major Deposit Types, District Metallogeny, the Evolution of Geological Provinces, and Exploration Methods. Geological Association of Canada, Mineral Deposits Division, Special Publication, V. 5, p. 163-183. Goodfellow, W. D., Lydon, J. W. and Turner, R. J. W., 1993- Geology and genesis of stratiform sediment-hosted (SEDEX) Zn-Pb-Ag sulphide deposits, in Kirkham, R. V., Sinclair, W. D., Thorpe, R. I. and Duke, J. M., eds., Mineral Deposit Modeling. Geological Association of Canada, Special Paper, V. 40, p. 201-251. Hnatyshin, D., Creaser, R. A., Wilkinson, J. J. and Gleeson, S. A., 2015- Re-Os dating of pyrite confirms an early diagenetic onset and extended duration of mineralization in the Irish Zn-Pb ore field. Geology V. 43, p. 143-146. Kelley, K. D., Leach, D. L., Johnson, C. A., Clark, J. L., Fayek, M., Slack, J. F., Anderson, V. M., Ayuso, R. A. and Ridley, W. I., 2004- Textural, compositional, and sulfur isotope variations of sulfide minerals in the Red Dog Zn-Pb-Ag deposits, Brooks Range, Alaska: Implications for ore formation. Econ. Geol, V. 99, p. 1509-1532. Leach, D. L., Sangster, D. F., Kelley, K. D., Large, R. R., Garven, G., Allen, C. R., Gutzmer, J. and Walters, S., 2005-Sedimenthosted lead-zinc deposits: A global perspective. Econ. Geol., 100th Anniversary Volume, p. 561-607. Mohajjel, M. and Fergusson, C. L., 2014- Jurassic to Cenozoic tectonics of the Zagros Orogen in northwestern Iran. International Geology Review, V. 3, p. 263-287. Momenzadeh, M., 1973- Investigation of the Kolisheh Lead-Zinc prospect, Khomein area. Geological survey of Iran, p. 35. Momenzadeh, M., 1976- Stratabound lead–zinc ores in the lower Cretaceous and Jurassic sediments in the Malayer–Esfahan district (west Central Iran), lithology, metal content, zonation and genesis. Unpublished PhD thesis, University of Heidelberg, p.300. Rajabi, A., Rastad, E, Canet, C. and Alfonso, P., 2015- The early Cambrian Chahmir shale-hosted Zn-Pb deposit, Central Iran: an example of vent-proximal SEDEX mineralization. Miner. Deposita, DOI 10.1007/s00126-014-0556-x. Rajabi, A., Rastad, E. and Canet, C., 2012- Metallogeny of Cretaceous carbonate-hosted Zn–Pb deposits of Iran: geotectonic setting and data integration for future mineral exploration. Int. Geol. Rev., V. 54, p. 1649-1672. Rastad, E., 1981- Geological, mineralogical, and facies investigations on the Lower Cretaceous stratabound Zn–Pb–(Ba–Cu) deposits of the IranKouh Mountain Range, Esfahan, west Central Iran. Ph.D. thesis, University of Heidelberg, 334 p.
Seyed-Emami, K., Brants, A. and Bozorgnia, F., 1971- Contributions to the paleontology and stratigraphy of Iran. 2. Stratigraphy of the Cretaceous rocks southeast of Esfahan. Geological Survey of Iran. Stampfli, G. M., and Borel, G. D., 2002- A plate tectonic model for the Paleozoic and Mesozoic constrained by dynamic plate boundaries and restored synthetic oceanic isochrones. Earth and Planetary Science Letters, V. 196, p. 17-33. Waasbergen, R. J. V., 1995- Sediment facies and environments of deposition on cretaceous pacific carbonate platforms: an overview of dredged rocks from western pacific guyots, Proceedings of the Ocean Drilling Program. Scientific Results, V. 143. Whitney, D. L. and Evans, B. W., 2010- Abbreviations for names of rock-forming minerals. American mineralogist, V. 95, p. 185-187. Wilkin, R. T. and Barnes, H. L., 1997- Formation processes of framboidal pyrite. Geochim Cosmochim Acta, V. 61, p. 323-339. Wilkinson, J. J. Eyre, S. L. and Boyce, A. J., 2005- Ore-Forming Processes in Irish-Type Carbonate-hosted Zn-Pb Deposits: Evidence from Mineralogy, Chemistry, and Isotopic Composition of Sulfides at the Lisheen. Mine. Econ. Geol., V. 100, p. 63–86. Wilkinson, J. J., 2014- Sediment-hosted zinc-lead mineralization: processes and perspectives. Treatise on Geochemistry 2nd edition, p. 219-249. Yarmohammadi, A., Rastad, E. and Rajabi, A., 2016- Geochemistry, fluid inclusion study and genesis of the sediment-hosted Zn-Pb (± Ag ± Cu) deposits of the Tiran basin, NW of Esfahan, Iran. J. Min. Geochem., V.193/2, p. 183-203.